Dill Dip from Desert Gardens is my secret weapon sauce for perfect salmon that is always a crowd pleaser! My Gourmet Cafe will make you the Hostess with the Mostess! Hosting a dinner party can be very stressful. Making sure the house is clean, mastering a delicious meal to present to your guests, setting the table… the list goes on. The thing is, a dinner party doesn’t HAVE to be stressful. It’s all about embracing a fun and relaxed atmosphere that keeps everyone at ease, including you! Here are some simple tips to hosting a casual dinner party. This may sound basic, but then again you may not think of it in your pre-party rush. There are few things I hate more than doing the dishes. So I always try to make sure the dishwasher is completely empty when the party begins. That way you have plenty of room for all the dirty dishes from the party, and you can load as you go. 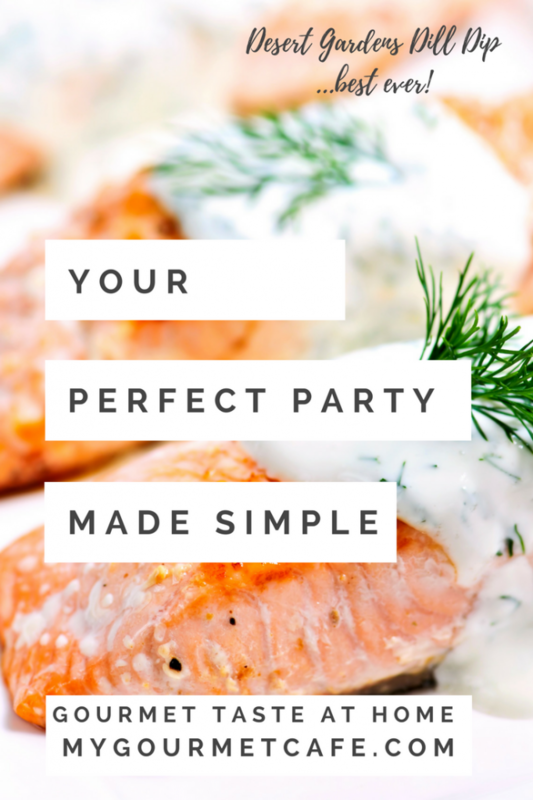 It’s a super simple step, but one that you’ll be grateful for as the party goes on! I also always make sure the trash has been taken out —there is nothing worse then having a full trash can during the party. I can’t stress it enough – get the unpleasant tasks out of the way before the party. I prep everything I am cooking ahead of time and wash knifes, cutting boards, and pots right after I’m done with them so there is way less to clean up after the party. Pro tip: Pre-make dessert as well (I will usually do this the night before)–that way, you just have to put it in the oven or heat it up on the stovetop! I NEVER try new recipes for a party. I count on the classics that I KNOW everyone loves! It’s no time to cut corners or skimp. I want my guest to feel like they are having a GOURMET experience when they are at my house and here is my big secret! From appetizers to soups to decadent main dish sauces I rely on Desert Gourmet mixes to add that extra zing and flavor that tastes like a fancy restaurant, but is truly simple to make AND is perfect to make ahead and have ready to go! Go here to check out your choices and start planning! 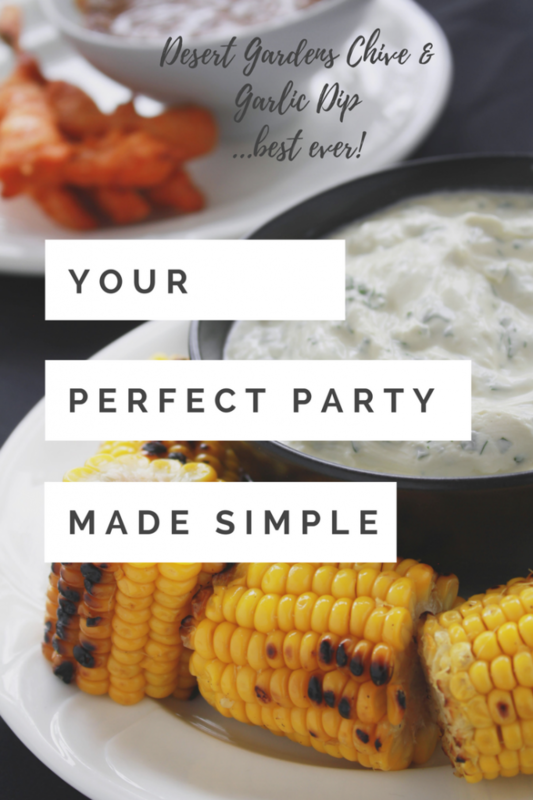 I hope these very simple tips help make your next party perfect and I know that you will love the ease and incredible flavors of Desert Gardens Mixes!!! Combining the taste of green chile with a classic potato soup, this instant mix needs only a mug and hot water to prepare. It’s made from a recipe that reflects Country Gardens Cuisine’s beginnings in Albuquerque, New Mexico, where a husband and wife team started their company in 1989. Now an industry leader in the gourmet prepared foods and seasoning industry, Country Gardens is your solution for a nutritious, convenient lunch or snack! If you’re looking for a warm lunchtime option to enjoy at your desk, consider our convenient Country Garden Broccoli and Cheese Soup. Easy to prepare with a creamy, delicious taste, Country Gardens blends aged cheddar cheeses with fresh broccoli and white rice for a nutritious, healthy snack. Great on the go or as an after school energy boost, it’s a simple, yummy way to get your vegetables using just hot water!